Shower Jellies are a form of glycerine soap that are made with carrageenan ( a seaweed derivative) to give it a jelly form. they wiggle & jiggle and lather like crazy. Best used with a shower pouf, just break off about a teaspoon full and add to your pouf! Sold in 7.5 oz. plastic pails. Sand & Surf Shower Jelly with matching Shower Pouf. Cotton Candy Shower jelly with matching shower pouf. Black Raspberry Shower Jelly with matching Shower Pouf. Lemon Drop Shower Jelly with matching Shower Pouf. A fizzy biscuit that can be broken into 4 parts. Drop into a non-bubbling hot water foot bath for an amazing treat for your feet. 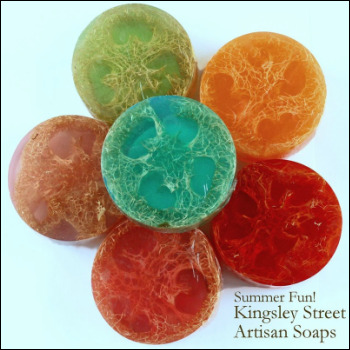 Designed like a bubbling bath bomb that soothes with rich coconut milk invigorating herbs and menthol for stimulation. A non greasy cream with eucalyptus, spearmint and menthol. Not only does it moisturize it also invigorates tired feet! This package contains our Extreme Foot Cream, Bubbly Foot Soak Biscuit (good for 4 foot baths), Eucalyptus and Spearmint Loofah Foot Scrub and a Pumice Brush.